As I learn more about cooking, I try and expose myself to new foods and techniques. 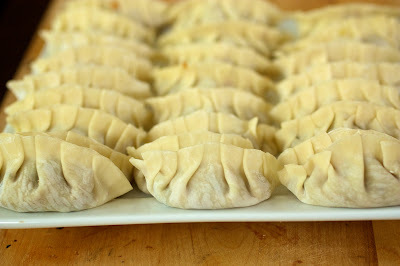 I have always been fascinated with potstickers and after reading this tutorial over at Steamy Kitchen, I realized making potstickers isn’t hard at all, just a little time consuming. This is where the labor of love comes into play. Being that I live in the middle of no where farm country, I have trouble finding ingredients that I need (ie dumpling skins.) So, after some internet research, I concluded that wonton wrappers (cut out with a cookie cutter) would work. I placed about a tablespoon of filling in the middle, used the cornstarch/water mix as glue around the entire edge, and then folded both sides up to meet in the middle. About halfway through making these, I was about to cry. I looked at my filling and I could barely tell that I made a dent. I have a feeling that after I do this a few times (and not take so many photos) this process will go faster. At this stage you can either freeze or cook the potstickers. 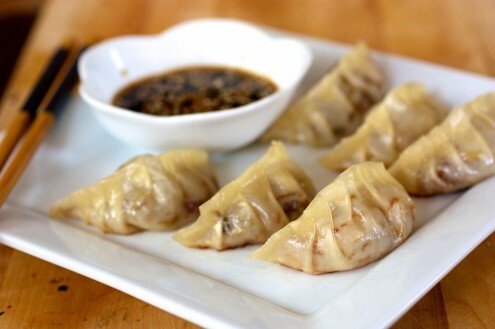 Heat about a tablespoon of oil and fry the bottoms of the potsticker for about one minute. Then, add 1/4 cup of water and a tight fitting lid. This will loosen the bottom from the pan and steam the filling. 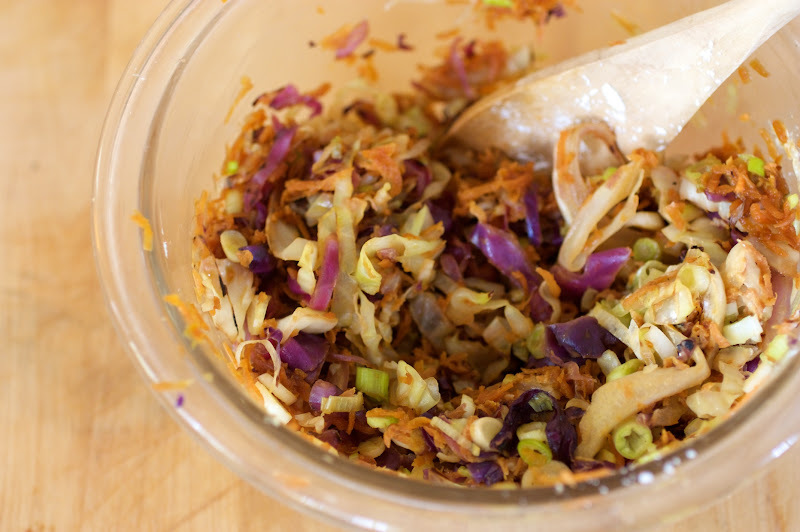 In a medium pan, saute cabbages and carrots together until slightly browned and wilted. Scoop into a bowl and combine with green onions. In a separate small bowl whisk together soy sauce, rice wine, and 1 tablespoon of cornstarch until corn starch is dissolved. 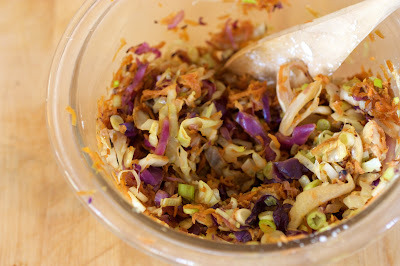 Pour over cabbage mixture and stir until all of the cabbage is covered. In a separate bowl, combine water and remaining 1/2 tablespoon of cornstarch. Working with one skin at a time, place about 1 tablespoon of filling in the middle. Dip your finger in the water/cornstarch mixture and run it along the entire edge of the wrapper. 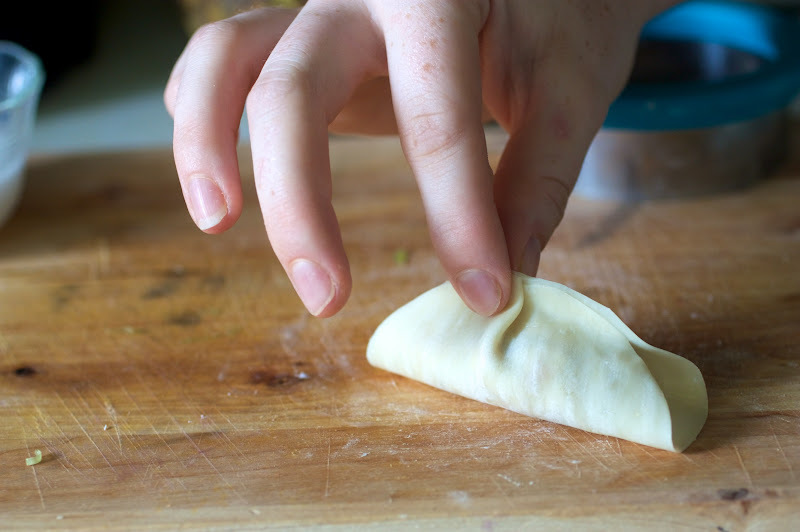 Fold both ends up and lightly pinch. Working with one side, pleat and pinch together making sure that once pleated, the potsticker is closed. Repeat with remaining filling. 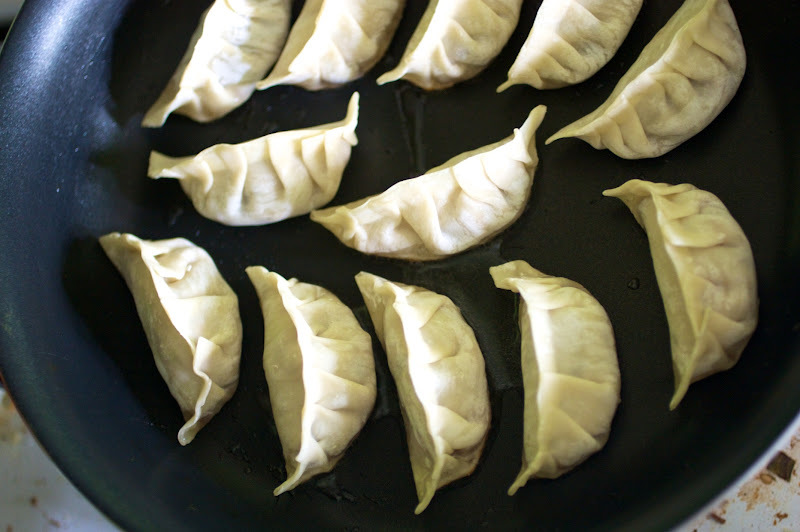 If you want, you may now freeze any potstickers you may not use. 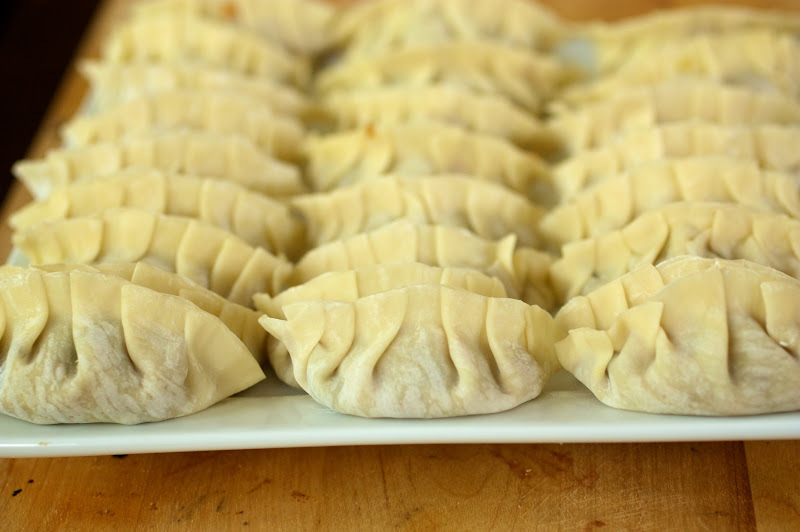 Simply place on a tray so that no potsticker is touching another and freeze. Once frozen you may then transfer to a container. When ready to eat, you can cook them frozen- just allow for a little extra time. For cooking potstickers, heat a tablespoon of oil (I used canola) over medium-high heat. Place potstickers in pan so that no potsticker is touching. Cook for 1- 1 1/2 minutes until bottom is browned. Pour in 1/4 cup of water, place a tight fitting lid on the pan, and continue to cook for another 3-4 minutes or until filling is done. I ate these with soy sauce but there are many different recipes out there for different dipping sauces. 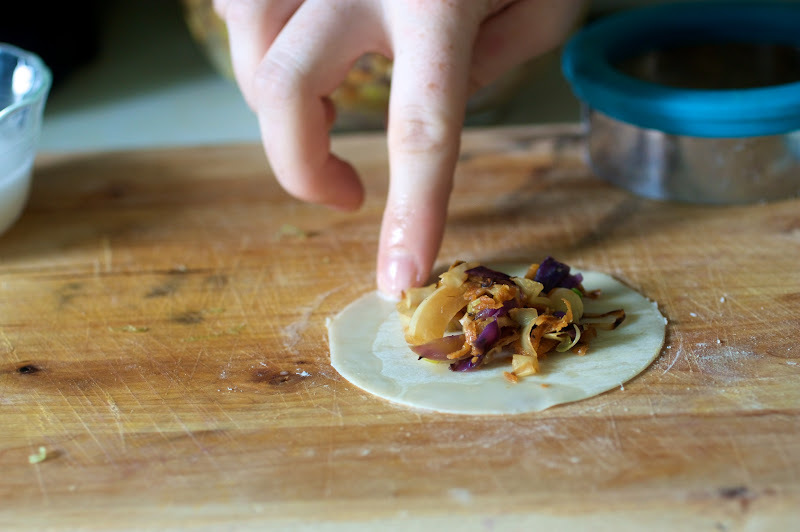 * you may also notice that my wrappers are slightly thin- I had to use wonton wrappers cut into circles because that is the closest thing I could find to a dumpling skin. Wow! THose look amazing and PERFECT! I have to make these!! These look GREAT! 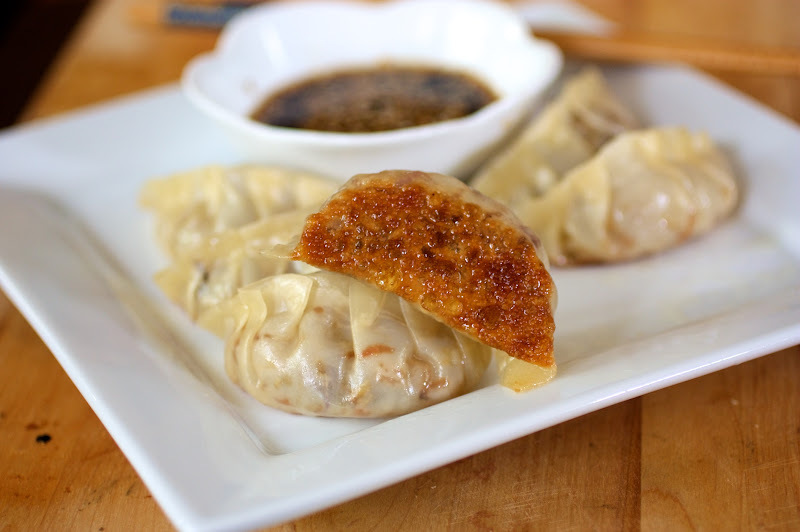 I’ve always heard that pot stickers are hard to make, but you make it sound so simple! I might (MIGHT) have to give these a try. I love your filling, too. Go for it! Like I said, the only thing I ran into is I got bored after making 20 of these things! The crispy bottom of the pot-sticker looks delish! And it’s such a versatile recipe, thanks for sharing it. Have been meaning to try these but always get lazy and intimidated! yours look wonderful, and so well made! do send it in for the Magic Bullet recipe contest/giveaway hosted on my blog:)Your recipe could win you a Free Magic Bullet To Go!